I like to think that I am a modern career woman and that I am not hampered by the “good ol’ boys club” — or that I can roll with them, at a minimum. In my office bubble, just working at my desk, I do not feel that I am treated differently. But when I read “What It Takes to Be a Trial Lawyer If You’re Not a Man” in The Atlantic, I realized that I do experience all of the issues facing female litigators. The article pointed out so many things that I do, know and notice about being a female commercial litigator that I just have accepted as part of my career. If I don’t do my wardrobe prep? I know there will be comments. Wear the wrong shoes? You’re not put together. Don’t blow out your hair? You’re disheveled. Forget to wear makeup? You look old and tired. The point is, female litigators must appear totally put together at all times. You can cry on the inside but don’t you dare show emotion on the outside. Acceptance is not the answer, but as the author states she is teaching the next generation of lawyers to do just that. If we do not accept, we will be criticized. So what do you do? I am usually the only female lawyer in the courtroom and I get why there are so few of us. It’s a job for the birds. And while I do do wear pants and flats to the office and my hair has a mind of its own some days, I refuse to acknowledge any insinuation that I am less of a litigator than my male counterparts. Female litigators are just as good, if not better. Just let us show you what we can really do when we are not hampered by expected behavior. Let us wear yoga pants instead of pantyhose and we will conquer the world! Do you want to share your stories? I would love to hear them! Please share them with me at apallozzi@offitkurman.com. Angela Pallozzi works with business owners to create policies that are beneficial to their businesses. 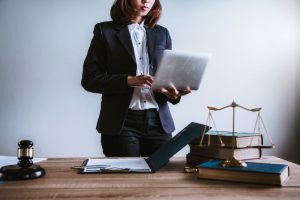 She regularly helps her clients with transactions, negotiations, disputes, litigation, and all types of daily business matters. Ms. Pallozzi advises business owners to prevent litigation and, should litigation occur, leads them through every step of the process to reach the best resolution. She works closely with her clients to understand their challenges and resolve them in the most efficient and effective manner.